Houses : Discover the cozy cocoon behind this white facade. 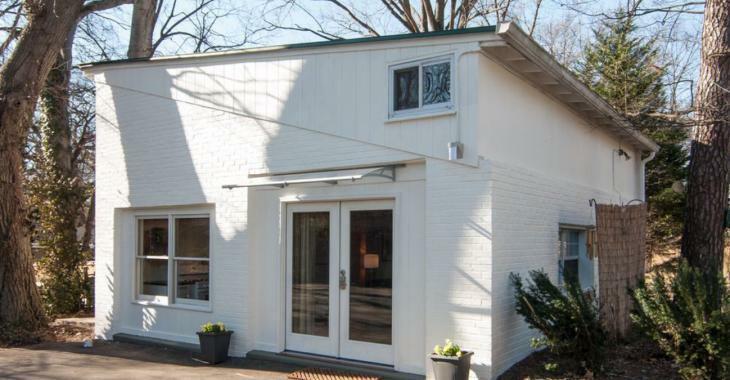 Discover the cozy cocoon behind this white facade. 700 square feet of pure charm! This industrial-looking outdoor guesthouse could be your next getaway destination in Nashville, USA. Available for vacation rental via VRBO, this unique and fashionable cottage far exceeds the average boring motel room. Its 700 square feet include a living room with two sitting areas, a bright kitchen and a bedroom in the upstairs attic. I was completely amazed by the interior of this little rental home. Even if you are not going to Nashville for a getaway, the visit is definitely worth it! This little house is pleasantly surprising; brick walls, exposed wooden beams and modern furniture give this house a warm and unique atmosphere! This small house is located five to ten minutes from downtown Nashville and can accommodate four people. Take the full tour below! The exposed brick walls add to the trendy atmosphere of this guest house. Colorful cushions and some green plants add life and character to the space. This living room does not lack personality! The living room has 13-feet ceilings and many bright windows, giving the space a sense of openness and brightness. The open floor plan allows access to the nearby kitchen and a partial view of the mezzanine upstairs. The kitchen area is bright with white cabinets and open-style shelves. The exposed ceiling is connected to the other industrial elements of the house. No bells and whistles in this room; a simple, classic kitchen that contains everything necessary to cook. The room is small but the cabinet finishes are very pretty! On the upper floor is the comfortable mezzanine with a bedroom to sleep and relax. The wooden headboard adds style to this space and allows a little more privacy in this mezzanine that opens onto the lower floor. Looks like a cozy little cocoon, right? The other side of the mezzanine contains shelves and drawers for storage. The lounge chair is a very comfortable place to read a good book! The small but efficient bathroom has built-in shelves for storage. Shelves of this type are always an excellent option when the square footage is limited in a room. The bathroom includes a shower. An additional seating area is located on the far side of the living room and includes a gas stove, yet still provides comfortable seating. The small house even has a small patio with chairs. The people who have had the chance to stay in this charming little house seem to have enjoyed their time here. I like this kind of decor that is both rustic and industrial, and you? The offer is $165 per night to sleep in this 700-square-foot house; a nice alternative to hotel rooms, or not? For more information on this rental, click on source at the bottom of this article. I hope you enjoyed your visit.